This popular Sindhi vegetarian recipe is made from lotus root (bhae in Urdu/Sindhi) in a onion based gravy with potatoes and tamarind pulp. The lotus root known as bhay/bhae/bhein in Sindhi and kanwal kakri in Urdu/Hindi is an indigenous vegetable grown in interior Sindh and used widely in Sindhi cuisine. I had it for the first time at my husband’s house. It’s a staple vegetable which mostly is consumed in its own salan (curry), sometimes with potatoes and as pakoras (gram fritters). It’s something that my husband has grown up eating, and I really wanted to try making it for him. It took quite a few tries but I finally managed to make a couple of recipes that he loves. This vegetable is only found at limited sabzi wala’s in Karachi. The places where I was successful in finding it were Imtiaz supermarket, Delhi colony and Jumaraat bazaar (Thursday Bazaar) near Boat Basin. Other sabzi wala’s may also have it. Bhae is grown in mud, which is why every single piece one buys will be covered in it. Scrape it off with a knife and then wash it carefully making sure it’s completely clean. Bhae is known for it’s particular ‘raisha’ / ‘laces’ / ‘threads’ that are exposed when bitten apart. In order to get that taste, it needs to be cut on the diagonal before cooking. 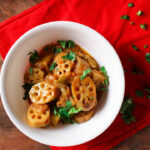 This popular Sindhi vegetarian recipe is made from lotus root (bhae in Urdu/Sindhi) in an onion based gravy with potatoes and tamarind pulp. 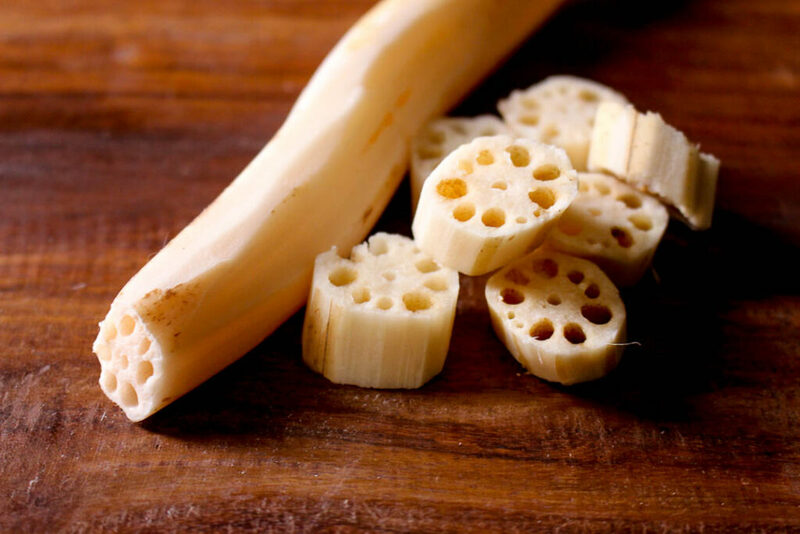 Clean and cut the lotus root / bhae diagonally. Boil in salted water for about 20 – 25 minutes. The cooking time depends on the thickness of the bhae but ideally, a knife should be able to pass through the stems. Wash, peel and cut the potatoes into small cubes. Soak in water, if cooking after a while so that they don’t turn black. Heat oil. Add ginger and garlic paste. Fry for 30 seconds and then add sliced onions. Cook onions till medium brown, but not burnt. Add tomatoes along with coriander powder, red chili powder, turmeric and salt. Cook for about 8-10 minutes till tomatoes are soft. Add potatoes along with water (about ½ cup – 1 cup depending on preferred amount of gravy). Cook till potatoes are soft. Add lotus root / bhae along with tamarind pulp. Cook for about 5 minutes. Adjust seasonings if required. Add green chilies and coriander. Keep on stove for 2-3 minutes till flavor infuses. Sprinkle with chaat masala and serve hot with roti. Goes well with green chutney.